Redemption location : All The Body Shop stores, except SOGO kiosk and Johor Premium Outlet. 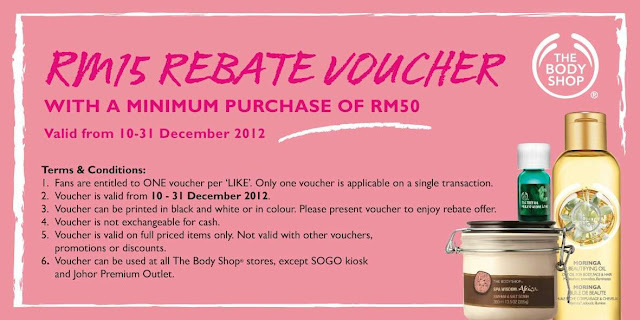 The Body Shop Malaysia is celebrating its facebook page fans reaching 120,000 fans by giving away RM15 rebate voucher for FREE! To enjoy this voucher, simply print the voucher below out (in black and white or colour), or flash this image using your phone to redeem! Fans are entitled to ONE voucher per 'LIKE'. Only one voucher is applicable on a single transaction. Voucher is valid on full priced items only. Not valid with other vouchers, promotions or discounts. LIKE & SHARE out this offer ya!